Packages are not valid in school holidays and over long weekends. All dives are subject to weather conditions on the day. Packages are based on 2 people sharing. A single supplement fee will apply. Transfers can be arranged from the airport at an extra fee. An advanced certification is required for these packages. 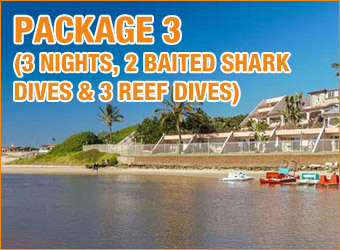 Upgrade to a PADI Advanced certification, with these packages for an extra R1500-00 per person. Add about 10% for 2019 rates. PLEASE NOTE: Due to the logistical planning of running a successful dive business, dives will only be refunded if we are not able to launch due to weather. All booked dives will not be refunded if not cancelled with at least 48 hours notice. You will be charged if you cancel your dives on the day due to being cold, sea sick, hung over, not being able to get down etc. In short, if you book a spot you will be charged for it. ALL DIVES ARE SUBJECT TO WEATHER CONDITIONS ON THE DAY AND THE SKIPPERS DECISION IS FINAL.